What do women want? It is a never ending mystery, but they sure can be pleased with jewelry. Why not buy your special someone a wonderful gift of Italian horn jewelry? Read about designs, prices and traditional history in our information guide. Italian horn jewelry is sure to please any one. It is beautiful, requires little maintenance, is available in a large variety of materials and most of all it is associated with good luck as well. From ancient times, Italian horns have been associated with good luck and having the power to ward of the evil eye. In olden days, the evil eye superstition was in full force. It was believed that jealousy alone could harm the fertility and sexual powers of men and women, fruits and harvest yields and even milking cattle. So, in order to guard themselves form the jealous intentions of others and for bringing good luck, people used to wear these horns. Italian horns have been linked to the moon goddess who was well loved and worshipped in Italy as well as parts of Europe, before the advent of Christianity. However, when Christianity became widespread in the region, the moon goddess was replaced with the images of the Virgin Mary, but the use of horns prevailed. It is still in vogue. The rising popularity of Italian horns has made designers look beyond the traditionally used Italian horn pendants. Various accessories in several forms and sizes are available easily these days. • Italian horn pendants are by and large still the most favorite. They can be worn alone or in layers with other pendants; whatever your style is. 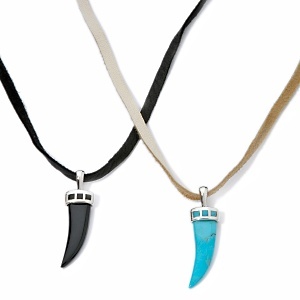 • Italian horn pendants along chains come as necklaces as well. Sometimes a chain has several Italian horns placed away equally, which looks quite stunning as well. Chains of different lengths are available. • Italian horn earrings are truly a pleasure. They come in various sizes and look amazingly beautiful in your ears. • Don’t forget the charm bracelets. Italian horn accessories can be dangled with the charm bracelets. • Italian horns have found place in the feet as well. Various anklets are available in which Italian horns hang down. • What about brooches? You can even pin these beautiful horns to your dress. You have ample choice in the choice of materials used in making Italian horn jewelry as well. Sterling Silver: Traditionally, the Italian horns were made of silver. As pure silver cannot be used alone because of its softness, a silver alloy, known as sterling silver is used. It is rhodium plated to give it more shine. Yellow Gold: Yellow gold is the most preferred choice these days. Italian horn jewelry is mostly being made in 14 carats as it is more durable, but some gold jewelry in 18 carats is also available. White Gold: White gold has the same properties as the yellow gold but it has higher content of the white metal as an alloy. It is rhodium plated to give it exceptional shine. Natural coral: Natural coral is the cheapest and most traditional choice in buying Italian horn jewelry.